Guppies are known for their beautiful appearance. They have long trailing fins, which resemble skirts. Like the Koi and Goldfish, the Guppy is a show fish. They come in a variety of colors, from red to blue to black. Wild guppies will have a brownish gray appearance. At maturity, Guppies will reach a size of one to two and a half inches. Males will tend to be much brighter than females. We are amongst the most reputed names in the industry, offering Guppy Fish. Reckoned amongst one of the distinguished business firms, we are keenly immersed in offering an inclusive variety of Blue Rainbow. Owing to their healthy nature and appealing appearance, these presented rainbow fishes are widely recommended. To add, their exceptional color combinations and flowing fins makes these a treasure to watch. Guppies are also called million fish and rainbow fish. Imported guppy, Varieties guppy available. From our wide consignment, we are engaged in supplying Guppy Fish. 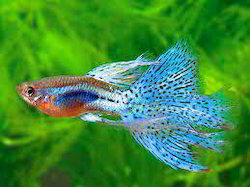 We are offering one of most popular Guppy fish different verity and body pattern with S – XL sizes our clients.